... einfach ein bisschen mehr Schwarzwald. This apartment consists of 2 rooms and is on the first floor of the guesthouse. The apartment measures 42 qm and is classified as non smoking area. After an eventful day you can relax and enjoy the peace and quiet of the lounge area or enjoy a glass of local wine watching the sunset from the northwest facing balcony. 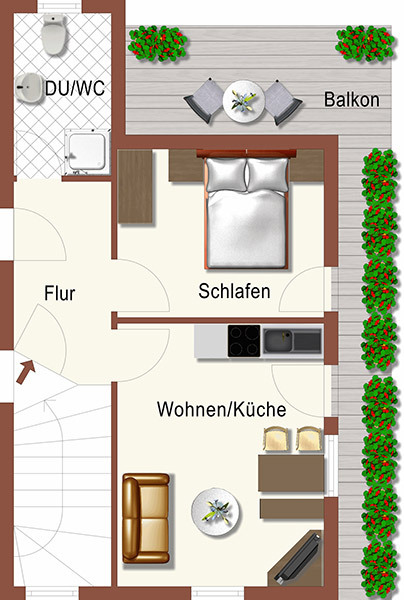 The apartment Bergwiese can be joined with the flat Blumenwiese to form a larger apartment under the name of "Kandelblick", which sleeps a maximum of 6 people.